It’s been a while since I managed to pull together a my week in crafts post mainly because the school holidays have meant very little time to craft. I’m hoping that things are about to change though as Little Miss C is now back at school and Master C started pre-school last week. It means a totally different shape to each day, but one that I’m hoping to fill with plenty of crafty activities, both with and without the kids. 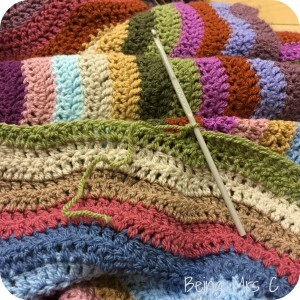 The main thing that has progressed this summer has been my Attic 24 ripple blanket. This is by far the biggest crochet project I’ve ever undertaken, and if I’m honest one of the biggest craft projects for a long long time. The blanket came on holiday with us twice over the summer and progress has been made in places ranging from cafes to soft play centres and from a static caravan to the bench in our garden (during that brief bit of summer that we did get!) My aim was to get it finished initially by school returning, and then I revised my plans to just have it finished by Master C’s birthday on the 22 September. I’ll come on to the significance of that date in a moment… But then disaster happened. The last ripple of meadow was progressing nicely yesterday (as I was sat on the floor in a school sports hall watching LMC play football) but then this happened! A desperate plea on Facebook for spare yarn resulted in so many strangers all across the country checking their stashes and offering to post yarn to me. Such is the power of the online crochet community – I really do feel humbled. In the end the gorgeous Aly from Bug, Bird and Bee has popped some in the post, but it does suddenly mean 48 hours of not being able to crochet! After being my go to craft for so long I felt lost last night not being able to continue once the kids were in bed – so much so that I ironed school shirts instead. If this has taught me anything then it’s to have more than one crochet project on the go at once! There is another project in the pipeline though in the form of my first ever Crochet Along (or CAL as they seem to be known online). I was invited to take part in this by the lovely people at Black Sheep Wools that I met when I went to Blog On up in Manchester next year. In exchange for sharing my progress here and on social media they have sent me the yarn pack needed to do the Spice of Life CAL which has been designed by the wonderful Sandra from Cherry Heart. I can’t begin to tell you how excited I am about this. Firstly I love the colours that Sandra has chosen and I’m also excited to be crocheting with the Rico Baby Classic DK which I have not used before. The colours and design together give it a perfect vintage style look which I instantly fell head over heals for. The second thing that actually gives me goosebumps as I think about it is the amazing community that appears to have sprung up online around the CAL. Until I started my ripple blanket and shared it on Instagram I hadn’t really realised just how big the online crochet community was. In a word HUGE. They are also some of the nicest women (and men) I have ever met online. Sharing successes and failures together (both yarn related and non-yarn related) they really are a community. Sandra started a Facebook group for the Spice of Life CAL just last Tuesday and it already has over 1600 members. Yep, 1600! How amazing is that? So far everyone is chatting abut their colour and yarn choices and what other projects they have in progress at the moment, but even still it’s as if this community has just clicked so quickly in a way that I have never seen online before. There’s a Ravelry group as well, but I’m almost scared to go in there as I’m not sure I have enough hours in the day to do it justice! So this CAL is why I’m so desperate to get my ripple blanket finished by the 22nd when it starts. I’m really excited about learning loads of new stitches and in doing so taking my crochet up to the next level. I’m also thrilled about the online crochet community that I’ve discovered and I’m so pleased to be part of it now. Quite what this will do for my yarn hoarding and bank balance though is something I’m trying not to think about for too long! Disclaimer: Black Sheep Wools have sent me the yarn for the Spice Of Life CAL. All opinions, excitement and crochet mistakes are entirely my own. It is an immense sense of pleasure when you complete a large craft project.i was happy to help you out, especially as you’re so close to finishing. Good luck getting the blanket done, I hope the rescue yarn saves the day!